For as much as Richard Branson would like to convince us otherwise, regular folks like us have precious little chance of ever leaving the comfort of Earth's atmosphere and venturing into space. But that doesn't mean you can't own an item that already has. Today is the final day to bid on more than 890 rare, museum-quality artifacts, manuscripts, and space flown memorabilia at RR Auction. Here are nine of the coolest artifacts up for grabs. This design was a derivative of the Sokol-K suit, with this model having a transverse zipper at the waist to allow for easier on and off capabilities, as well as making it more customizable to individual cosmonaut's sizes. Designed as a 'rescue suit,' it kept the astronaut alive in case of accidental depressurization of the spacecraft. Suit appears to be complete with helmet, boots, gloves, and cables. A manometer is attached to the upper arm, and several patches are sewn to the upper torso. Fantastic and incredibly rare lunar module control panel #3, 29.75 x 8, which represents an earlier engineer mock-up of the final design. This panel incorporates some design attributes of final flown designs with some other components, which are not flight representative, including some of the switches. This panel was vital for landing on the moon as it monitored attitude, radar, exterior lighting, and perhaps the most important indicator in the entire space craft, the lunar contact light. This panel, #3, would have been located directly under the Alignment Optical Telescope, in between the two astronauts as they piloted the lunar module This particular panel appears to have been rejected during testing as indicated by the red "Discrepant material" sticker affixed to the reverse. Panel is signed in black felt tip by seven moonwalkers: Buzz Aldrin, Alan Bean, Dave Scott, John Young, Edgar Mitchell, Gene Cernan, and Charlie Duke, each adding his Apollo mission under his signature. In fine condition, with expected wear to panel. Lunar control panels have come to the market only a couple of times, with panel #3 perhaps being the most recognizable and desirable of all. Apollo 11 'Type 3' insurance cover with a cachet of the mission insignia, bearing a July 16, 1969, Kennedy Space Center cancellation, signed in blue felt tip by Neil Armstrong, Buzz Aldrin, and Michael Collins. In very fine condition. Accompanied by a printed informational sheet stating the cover comes from the Michael Collins Family collection. The 'Type 3' cover rates as the least commonly found of the three Apollo 11 insurance covers. Apollo-era Constant Wear Garment, manufactured in 1968, issued to Buzz Aldrin for use during the Apollo 11 training and mission. White cotton one-piece garment has a Beta cloth name tag sewn on the left breast and reads, "E. Aldrin," and a manufacturer's label sewn into the collar which reads, "Constant Wear Garment; P/N SEB 13100061-208 [model number consistent on every Apollo 11 crew member's CWG]; Size MR S/N 1228 [individual serial number for this specific garment]; Date August 1968; Contract No. NAS 9-7721; Contractor Atlas Underwear Corp." Garment has multiple openings and attachments at midriff to integrate the bio-instrumentation harness which each crew member wore. The Constant Wear Garment (CGW) was designed to be worn under the inflight Coveralls (ICG) as well as the A7L Spacesuit Pressure Garment Assembly (as part of the complete spacesuit system). This garment served multiple functions during flight including providing the crew member with warmth, in addition to absorption and transportation of sweat. The specification/part number which bears the stamped out "-005" and the re-stamped "208" reflects a modification of the original garment to the 'as flown' configuration, likely done near the time of issue. Apollo 11 CM Pilot Michael Collins's flown constant wear garment is part of the National Air and Space Museum Collection and was on display there for many years; it is now viewable online. Though this Aldrin garment would not have actually been flown, it is essentially a duplicate of the variant that was; the fact it was issued to Apollo 11 crew member Buzz Aldrin, the second man to walk on the moon, only enhances its desirability. Flown aluminum 'lunar rover license' plate, 1.25 x .5, marked with the registration number "LRV 001", with "MOON" as the home state, the year 1971, and the NASA and Boeing logos in the corners. Astronaut Dave Scott carried this in his space suit knee pocket on all three lunar EVAs, including on the lunar rover. Accompanied by a letter of authenticity from Dave Scott, stating, in part: "I hereby certify that the miniature 'LRV-001' license plate included with this letter is from my personal collection and was carried in the pocket of my A7L-B spacesuit during Apollo 15…To commemorate the first use of the Lunar Roving Vehicle (LRV), the first vehicle to be driven on another world, I designed and had produced this small license plate for use as a memento of our lunar expedition. I carried this license plate in a pocket of my Apollo A7L-B EVA spacesuit (shown below) during our nearly three-day stay on the Moon as we drove 27.76 km across the lunar surface." In fine condition, with a few trivial surface marks. This plate, along with others, was prepackaged in a pack smaller than a pack of gum, which was stowed in the left knee pocket of Scott's space suit before the launch and remained there until after his return to earth. It was in space for 12 days, 7 hours from launch to splashdown. More importantly, it spent nearly 67 hours on the moon, including 18h 30m of EVAs, and was carried on LRV itself for around 17 miles across the lunar surface. Toothbrush flown and used by John Young during the Gemini 10 mission in 1966. Ivory-colored toothbrush is made by Py-Co-Pay and measures 6.5″ long. Accompanied by a 2010 signed letter of authenticity from Young which states, in part: "I hereby certify that the ivory colored…toothbrush that accompanies this letter was flown and used by me aboard the flight of Gemini 10…It has been part of my personal collection since the mission." Also accompanied by a color 8 x 10 photo of Young holding the toothbrush and certificate. In fine condition. 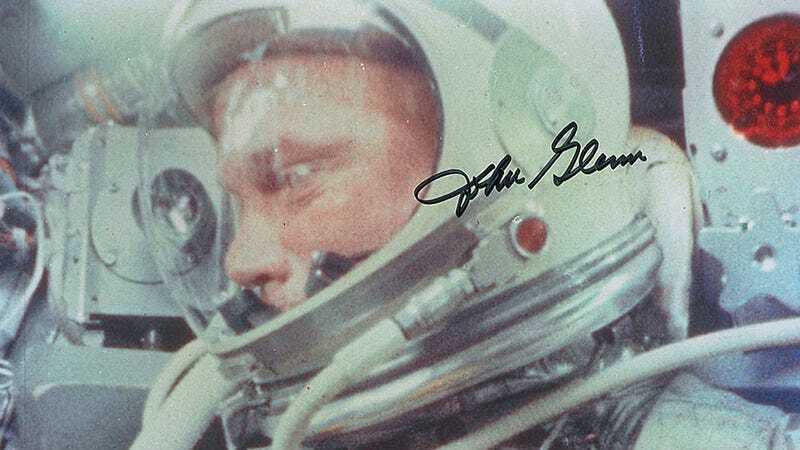 A personal item which orbited the earth 43 times, used by one of NASA's most well-traveled astronauts. Fully-certified artifacts from Young, complete with his written and photographic certification, are quite uncommon and highly-desirable. An Apollo Saturn TR-204 Attitude Control engine. Engine measures 15.5″ long, with the nozzle having a 6.5″ diameter, and weighing approximately 26.5 pounds. Fabricated by Thompson Ramo Wooldridge (TRW), the nozzle and chamber are made of phenolic impregnated silica with fiberglass overwrap. The nozzle has a sprayed zirconia coating, with the propellant inlets and valves made of metal. Its design is unique—because of the requiremet for high reliability, the engine was designed with quad-redundant valves. Engine bears a George C. Marshall Space Flight Center metal label and reads, "Engine Auxiliary Propulsion Attitude Control 150 LB / Ser. No. 531 / Date: 3-65." These engines were in service from January 1966 to July 1975 and saw application on every Saturn V Moon rocket to provide attitude control of the Third Stage during Earth Orbit and Trans-Lunar Injection. These engines also provided propulsion after third stage separation from the Command Service Module to propel the Third Stage to impact on the Moon's surface. NASA flight helmet circa 1965. US Navy APH-6B helmet has a dual visor, clear and sun, as well as an A13A oxygen mask, both made by Sierra Engineering Corp, with the oxygen mask helmet attachments by Dunrite Tool and Die. The ID label on the helmet and one of the two visor knobs are missing as is the head padding inside the helmet. The earphones are intact as are the earphone attachment cords. There is a NASA decal on the helmet above a stencil of the aviator's name "Cambiaso," who was a NASA photo tech. A scarce helmet in excellent overall condition. Provenance: Goldberg, 2008. RR Auction COA. Extensively flown Beaulieu movie camera flown to the Salyut 6 space station on board Soyuz 26 in 1977 and returned to earth three years later on board Soyuz T-3. This 16 mm camera is fitted with a semi-automatic P. Angenieux (Paris) 120 mm zoom lens that is designed for outdoor use only. During the period this was on board the space station it was available for use (during EVAs only) by a total of 29 cosmonauts who served aboard Salyut 6, including Yuri Romanenko, Georgi Grechko, Vladimir Dzhanibekov, Oleg Makarov, Aleksei Gubarev, Valery Bykovsky, Leonid Kizim, and Gennady Strekalov. Camera is accompanied by a counterbalance and battery which screws into the bottom. Also accompanied by a typed letter of authenticity from Valery Bykovsky, listing the 29 cosmonauts who had access to the camera while it was in space. In fine and apparent working condition. A total of three space walks were conducted on Salyut 6 from 1977–1979, although it is unknown if this camera was used during any of the EVAs.